Independence Day was the last science fiction movie I saw while I was still at school. 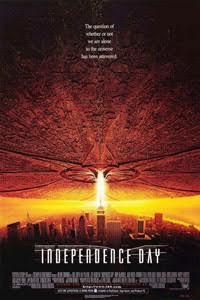 Directed by Roland Emmerich, the movie released in 1996, was supposed to have established a milestone in use of computer graphics in movies. Indeed the kind of destruction portrayed in the movie was mind boggling. This story is a contemporary thriller that centers around an alien attack on earth. It follows the familiar script of most disaster movies. A protagonist discovers a source of danger to the world and try to warn the rest of the world – the world however is skeptic, fails to acknowledge the evidence presented and dismisses the danger as a creation of his or her imaginative mind. While the protagonist struggles to convince, the first bout of disaster strikes and the world is convinced and the rest of the story deals with how the world solves the danger. The danger could be as small as a crocodile or a shark or as big as asteroids striking earth. Here the dangers comes in the form of an alien attack on earth. There is no single protagonist. There are different sets of protagonists –each one playing critical roles in mitigating the danger to humanity. There are the ones who give the early warning, the ones, who come up with strategies to counter attack the aliens and ones who do the actual fighting. Then there are people showing courage at a smaller level protecting their near and dear ones in face of the panic that has resulted due to the alien attack. The key theme in the movie is the reaction of human society to cataclysmic danger. Then we have some small interpersonal drama happening between the characters. The movie tries to bring in people from different demographics as protagonists. While that makes the movie inclusive, there is no single character for the viewer to root for. From a science fiction point of view, I hardly found anything conceptually amazing as such. While one alien was shown being captured and brought in for the earth scientists to examine, we really do not see much of the aliens. Whatever information is revealed about them is in line with popular clichés. Most of the story line was quite predictable. Maybe there was some novelty in the way the humans defeat the aliens – a kind of twist on the idea from HG Wells’ War of the Worlds. Talking of War of the World, the movie somehow could not create the dark scary mood of HG Wells’ story – the mood was more like that of the typical Hollywood potboiler – some adrenaline filled moments, a climax and a happy ending. The area the movie won lot of acclaim for was the special effects. While it was an impressive spectacle, it was not backed by a strong story line. Also I find creative beauty such as the world in Lord of the Rings and Avatar more appealing than mass destruction. But I guess that has its own following – after all the movie was one of the highest grossers of its time. This is probably one of those science fiction movies I would definitely not like to watch again. I remember this one becoming quite popular thanks to the phony patriotism darned into the theme. I didn't like the ridiculous climax either. But I am running away with the beauty of your composition. The science ficiton /fantasy series at your blog are about the best I get to read around here. Carry on, Yoda! Thanks Umashaankar. I kept feeling I missed something in my review - It was this American patriotism angle. That is why I did not like it - you know how I feel about action movies.